Please send message before booking !! You're a 5 minute walk to the white sands of Siesta Key, with private beach access directly across the street. Just a few minutes walk to restaurants like Capt. Curt's and the Daiquiri Deck. Catch one of the many shuttles to Siesta Key Village and enjoy the festive, island lifestyle. Beyond the radiant sun and sand, discover Sarasota’s eclectic blend of culture and fine dining along with the magic of the circus. Fly into either Tampa or Ft. Myers. We're just over an hour from each airport. Thirty minutes from Sarasota-Bradenton airport. Two hours from Disney. Beautifully decorated, this unit is not a typical rental condo. We use it extensively ourselves and consider it our 2nd home. There are 2 bedrooms, 1 king (32in flat screen ), 2 twin (with T.V. ), (sleeps 4) two baths, the master bath with a Roman tub/shower and twin sinks. The unit has a full kitchen... dishes/ cookware/ utensils/ dishwasher/ microwave/ disposal/ toaster/coffeemaker and blender. Washer and dryer in unit. Entertainment center with cable-TV, DVD/VCR and AM/FM stereo. Linens, towels & beach towels. 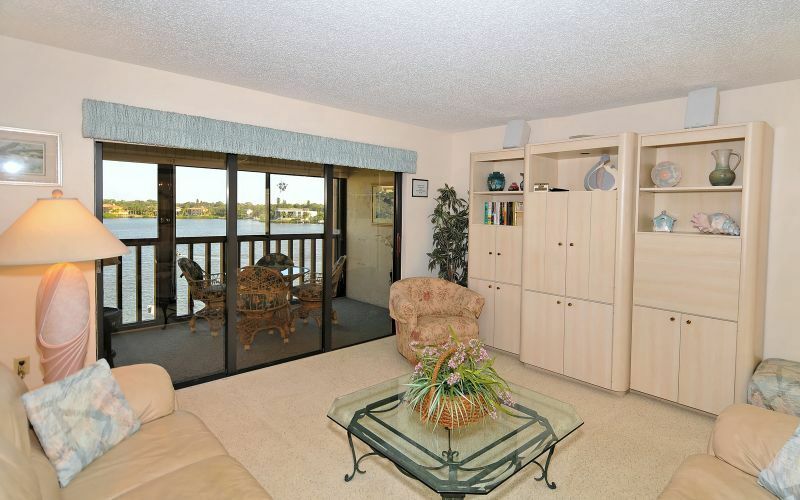 Spacious 1,800 sq.. ft. condo directly on the intracoastal waterway. Relax and watch dolphins and passing yachts from your lanai. See pelicans, ospreys, herons and egrets. Stroll the beach. Watch the sunsets. Walking distance to fine restaurants, shopping and entertainment. Nearby watersports rentals, parasail and charter fishing...or fish from shore in front of the condo, if you prefer. Enjoy Sarasota's extensive fine arts and shopping at St. Armand's. Play golf at the many nearby courses. Take a sunset dinner cruise on Sarasota Bay or a sailing charter on the Gulf. Or just stroll around behind the gates of the lush, tropically landscaped grounds of the complex. The harbor path is lighted for evening walks. Air conditioned, heat, phone (no charge for local calls), cable TV and VCR and Stereo in living room and cable TV and VCR in master bedroom, 8 X 26 screened lanai with glass doors, full kitchen, linens provided, washer and dryer in unit, 2 heated pools, covered parking, elevator building. Wireless Internet available in the unit. Free beach chairs and umbrellas. WOW! We loved this place. The condo was clean, well furnished and had everything we needed for a week vacation. Since this is a corner unit, the views of the intercostal were fabulous. We ate breakfast on the lanai every morning and soaked in the surroundings. Ian, the beach attendant, was a rock star and had lounge chairs and umbrellas ready on the beach every day. There are several good restaurants and bars within easy walking distance and they have live music each evening. We did some charter fishing one day and one of the local restaurants cooked the fish for us that evening - really fun. Loretta was easy to work with, happily answered all our questions, and made the whole process simple and hassle free. We would definitely stay with her again. Loretta was great to work with. This was our first time staying on Siesta Key. My husband and I were looking for a fall get-away and Loretta's condo was the right choice. The unit is a corner penthouse and overlooks the inter coastal. We enjoyed having morning breakfast on the lanai and watching the beautiful boats go by. The property has grills you can use, which we took advantage of several nights. The beach attendant was great and set up a sun umbrella for us each time we went down there. The condo was spotless. The kitchen had everything we needed. It felt like we were at home (I wish it was my home!). Everything was perfect. Thank you Loretta for letting us stay with you. Thank You, I am glad you enjoyed your stay at our Home away from Home. You are right - it is so nice and convenient to have your chairs and umbrella waiting for you at the beach. Hope to see you again!!!!!! This is our second time at Loretta's condo this year. My wife and I stayed here in May and absolutely love the unit and the area. It did not take long to decide to come back for our Fall vacation. If you have the opportunity we suggest you stay in this unit. Everything you need for a great time in Siesta is provided. The beach is fabulous and the sunsets are spectacular. My wife and I have just returned from Siesta after a week in this great unit. Siesta Key is everything advertised, beautiful beaches, funky village and awesome weather. What made this vacation fabulous is all of the above and particularly this unit. It is very spacious and clean. ; there is nothing you will need that is not provided here. Being on the Bay side means a bit of walk to the beach (but nothing onerous). Beach chairs and umbrellas are provided at the beach, the beach attendant Ian was great, always ready to help. The beach itself is out of this world; the sand is literally like flour and you won't burn your feet. The water was aqua much like the Caribbean. What pushed our week here over the top is the location of the unit; right on the bay with water views from the screened Lani and the kitchen. We sat and watch the boats go by ever day, it never got old. We will return soon. We spent a week at this condo in early January. I can’t begin to describe the view from the lanai. It overlooks a small bay on the intercoastal and all day we were able to see boats and birds fly by and one time even saw a small school of dolphins. The condo itself is beautiful. It’s very clean and has a nice open living room and dining area. The kitchen had everything we needed to cook our own meals. I think our favorite room, though, was the lanai. You can access it from both the bedroom and living room. During the warm days, we left the opened the sliding glass doors so that we could enjoy the fresh air and breeze. The nights were a little cool, so we closed the glass doors but still were able to enjoy the view. There are several stores and restaurants within walking distance, so we didn’t need to take our car out too often. Overall, the condo had everything we needed to relax and enjoy our time on Siesta Key. You really can’t go wrong with this place. The owner was real easy to work with too. The views from this penthose are Incredible! You are right on the intercoastal and you can see for miles! Inside, you have everything you need to enjoy your stay. Very roomy and the screened porch is a real treat too. Just below is a private bay where we were able to fish from piers. Fishing was terrific - we caught all kinds. Just across the street was one of the top ten beaches listed in Florida. We think it's the best one. The sand is pure white and feels like powder! The pool on property was great and not crowded either. There is a great choice in local restaurants too. Some are within walking distance - our favorite was at the Marina just across the bridge. Just a short drive up the island was the little town with more restaurants and shops. Great breakfast place too. There is a good choice of golf courses close by too. We also visited the Ringling Museum, Art museum, and St Armands Circle is a must for everyone! This penthouse has it all - you can simply relax or take in the many attractions. You will enjoy your stay. - We did! Crescent Beach, with its three miles of white, sugar-like sand, is rated as one of the most beautiful beaches in the world. Its smooth, fine sand and gentle slope are perfect for walking, jogging-even pushing strollers. Look for shells, watch for dolphins, or just watch the people as you stroll along this inviting gulf shore. On the street side, it's an easy walk or a short drive to shops, stores and restaurants. Swimming, beach-walking, sun-bathing, shelling, sailing, para-sailing, jet-skiing, wind-surfing, fishing, wildlife-viewing, live professional theater, cinemas, museums, ballet, concerts, good restaurants, golf. 2-hour drive from Orlando (Disney, MGM, Universal Studios, SeaWorld). 1 hour, 15 minute-drive from Tampa (Busch Gardens, NFL, NHL). Call Owner for other payment options. 847-471-2363 (Loretta) No Pets allowed and this is a NON-SMOKING UNIT 7 night Minimum Rental. Check in: 3 PM Check out: 10 AM. Rates are subject to change without notice. CANCELLATION POLICY A cancellation request must be made in writing and acknowledged by the office. For stays of less than 3 weeks: if a cancellation is made more than 60 days prior to arrival date, a refund will be made to the renter minus a $95.00 cancellation fee. If cancellation is made less than 60 days of the arrival date, no refund is provided. No change in dates shortening the stay or change in unit chosen is allowed within 60 days from arrival date without loss of all monies paid. All payments made on bookings for 3 weeks or more are non-refundable at anytime for any reason if cancelling. No change in dates decreasing stay or change in unit chosen is allowed at any time without loss of all monies paid.